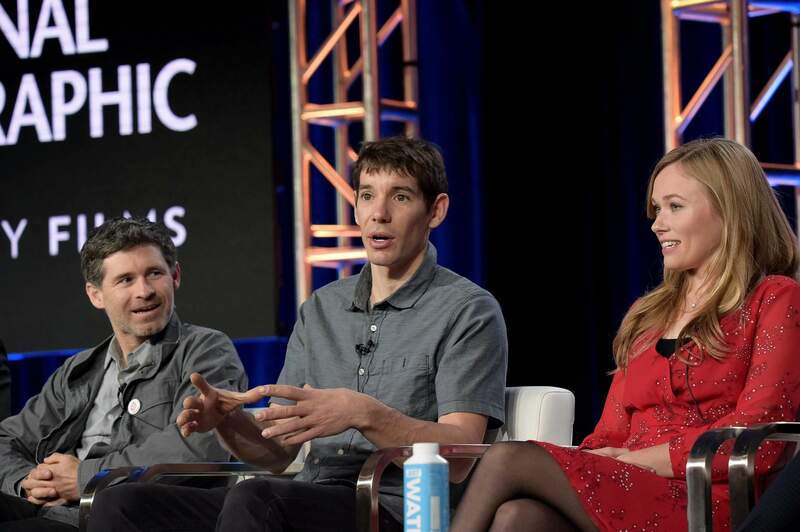 Mikey Schaefer, from left, Alex Honnold and Sanni McCandless participate in the “Free Solo” panel during the National Geographic portion of the TCA Winter Press Tour on Friday in Pasadena, Calif.
PASADENA, Calif. – Makers of the “Free Solo” documentary about Alex Honnold’s unaided climb up the rock face of Yosemite’s El Capitan say they would have still made the film if Honnold had slipped and fell to his death. Hannold practiced for two years before his climb. One particularly challenging spot, known as the Boulder Problem that required some dexterity, he practiced about 50 or 60 times and thought about all the time, he said.